This is a one-of-a-kind event for over 50 years. The event is scheduled to be held on the second Saturday (weather permitting). 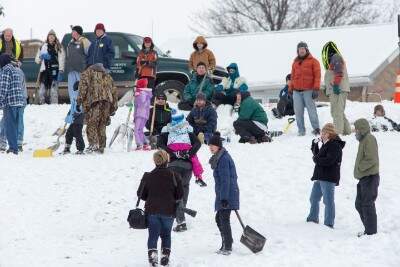 If there is not sufficient snow on the ground to hold the event that day, it will be postponed to the following Saturday and thereon until it is held, up to the last Saturday in February. If cancelled the information will be posted by Noon on Thursday on the Beaver County Ice Arena Facebook page. All ages can participate in regular and modified divisions while attempting to slide down a 160′ snow-covered slope in the fastest time. Trophies will be awarded to all first and second place winners. Spectators welcome. Free event.